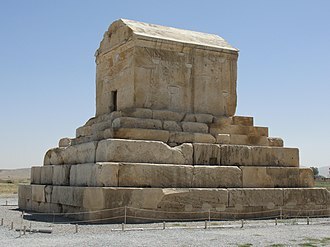 Artaxerxes I /ˌɑːrtəˈzɜːrksiːz/ was the fifth King of Persia from 465 BC to 424 BC. He was the son of Xerxes I. 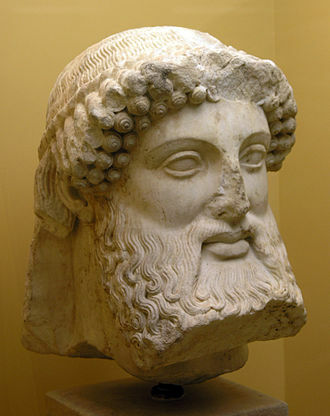 He may have been the Artasyrus mentioned by Herodotus as being a Satrap of the satrapy of Bactria. 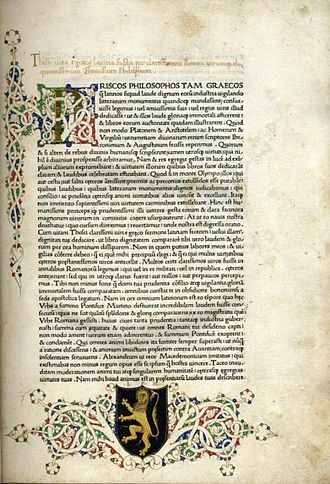 In Greek sources he is surnamed μακρόχειρ Macrocheir, allegedly because his hand was longer than his left. 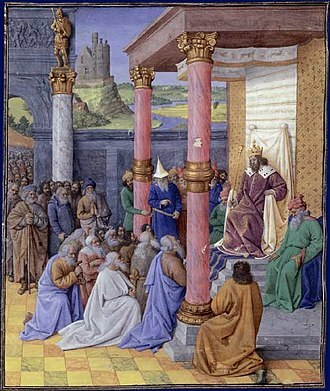 Artaxerxes was probably born in the reign of his grandfather Darius I, to the son and heir. 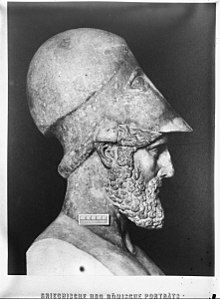 In 465 BC, Xerxes I was murdered by Artabanus, the commander of the royal bodyguard, Greek historians give contradicting accounts of events. 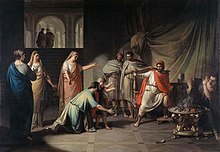 According to Ctesias, Artabanus accused the Crown Prince Darius, Xerxess eldest son, of the murder and persuaded Artaxerxes, but according to Aristotle, Artabanus killed Darius first and killed Xerxes. 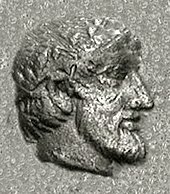 After Artaxerxes discovered the murder, he killed Artabanus and his sons and he had to face a revolt in Egypt in 460–454 BC led by Inaros II, who was the son of a Libyan prince named Psamtik, presumably of the old Saite line. In 460 BC, Inaros II revolted against the Persians with the help of his Athenian allies, the Persians retreated to Memphis, and the Athenians were finally defeated in 454 BC, by the Persian army led by Megabyzus, after a two-year siege. 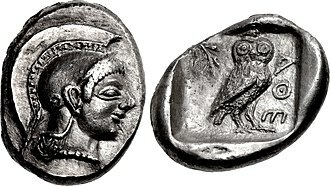 Inaros was captured and carried away to Susa, after Persia had been defeated at Eurymedon, military action between Greece and Persia was at a standstill. 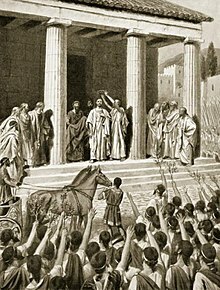 When Artaxerxes I took power, he introduced a new Persian strategy of weakening the Athenians by funding their enemies in Greece and this indirectly caused the Athenians to move the treasury of the Delian League from the island of Delos to the Athenian acropolis. 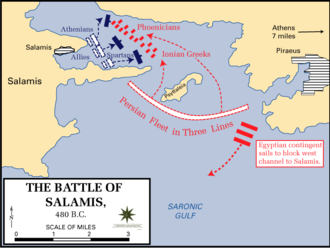 This funding practice inevitably prompted renewed fighting in 450 BC, where the Greeks attacked at the Battle of Cyprus, after Cimons failure to attain much in this expedition, the Peace of Callias was agreed among Athens and Persia in 449 BC. 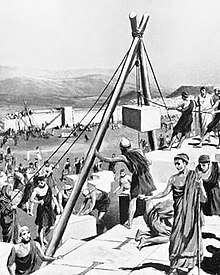 Artaxerxes I offered asylum to Themistocles, who was probably his father Xerxess greatest enemy for his victory at the Battle of Salamis, Artaxerxes I gave him Magnesia and Lampsacus to maintain him in bread and wine. 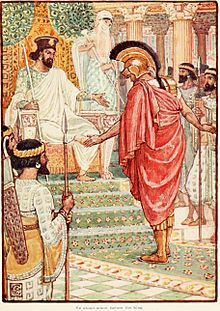 In addition, Artaxerxes I gave him Palaescepsis to provide him with clothes, Themistocles would go on to learn and adopt Persian customs, Persian language, and traditions. The second Persian invasion of Greece occurred during the Greco-Persian Wars, as King Xerxes I of Persia sought to conquer all of Greece. 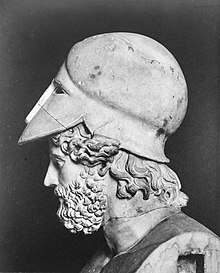 The invasion was a direct, if delayed, response to the defeat of the first Persian invasion of Greece at the Battle of Marathon, after Dariuss death, his son Xerxes spent several years planning for the second invasion, mustering an enormous army and navy. 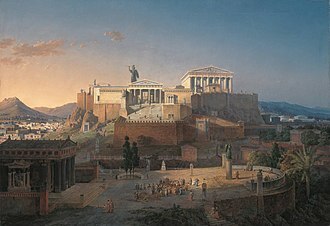 The Athenians and Spartans led the Greek resistance, about a tenth of the Greek city-states joined the Allied effort, most remained neutral or submitted to Xerxes. The invasion began in spring 480 BC, when the Persian army crossed the Hellespont and marched through Thrace and Macedon to Thessaly. At the famous Battle of Thermopylae, the Allied army held back the Persian army for seven days, before they were outflanked by a mountain path and the Allied rearguard was trapped and annihilated. 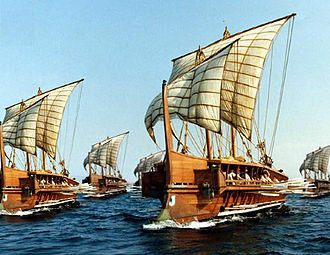 The Allied fleet had withstood two days of Persian attacks at the Battle of Artemisium, but when news reached them of the disaster at Thermopylae, after Thermopylae, all of Boeotia and Attica fell to the Persian army, which captured and burnt Athens. 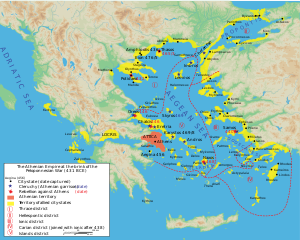 However, a larger Allied army fortified the narrow Isthmus of Corinth, both sides thus sought a naval victory that might decisively alter the course of the war. 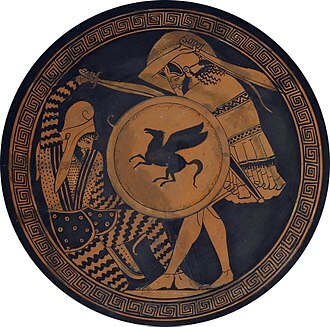 The following spring, the Allies assembled the largest ever hoplite army, at the ensuing Battle of Plataea, the Greek infantry again proved its superiority, inflicting a severe defeat on the Persians and killing Mardonius in the process. 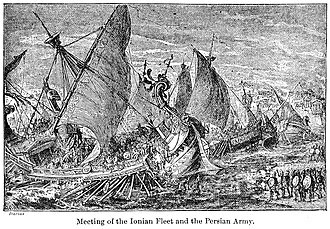 On the same day, across the Aegean Sea an Allied navy destroyed the remnants of the Persian navy at the Battle of Mycale, with this double defeat, the invasion was ended, and Persian power in the Aegean severely dented. 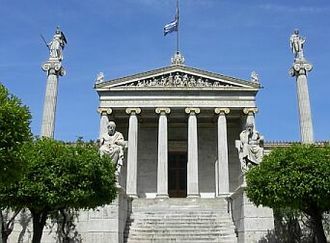 The Greeks would now move to the offensive, eventually expelling the Persians from Europe, the main source for the Great Greco-Persian Wars is the Greek historian Herodotus. 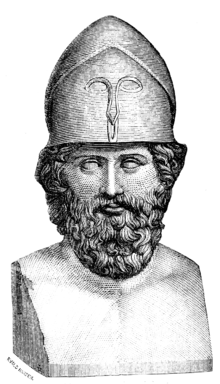 Herodotus, who has called the Father of History, was born in 484 BC in Halicarnassus. 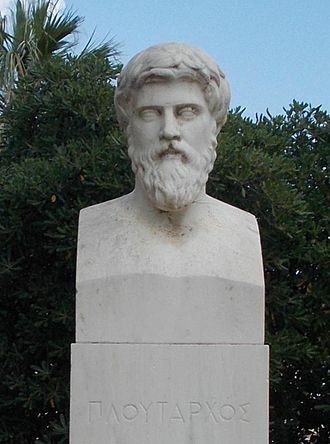 He wrote his Enquiries around 440–430 BC, trying to trace the origins of the Greco-Persian Wars, Herodotuss approach was entirely novel, and at least in Western society, he does seem to have invented history as we know it. 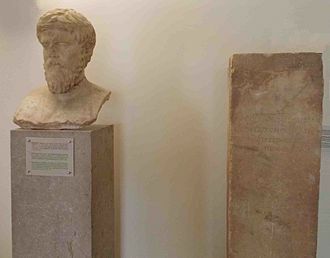 Magnesia or Magnesia on the Maeander was an ancient Greek city in Ionia, considerable in size, at an important location commercially and strategically in the triangle of Priene and Tralles. 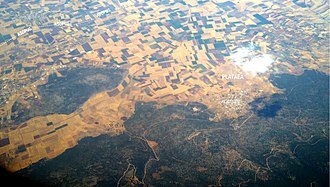 The city was named Magnesia, after the Magnetes from Thessaly who settled the area along with some Cretans and it was called on the Meander to distinguish it from the nearby Lydian city Magnesia ad Sipylum. The territory around Magnesia was extremely fertile, and produced excellent wine, figs and it was built on the slope of Mount Thorax, on the banks of the small river Lethacus, a tributary of the Maeander river upstream from Ephesus. 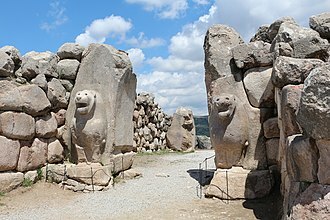 It was 15 miles from the city of Miletus, the ruins of the city are located west of the modern village Tekin in the Germencik district of Aydın Province, Turkey. 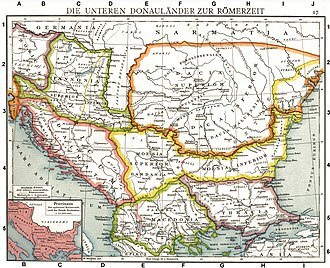 Magnesia lay within Ionia, but because it had settled by Aeolians from Greece, was not accepted into the Ionian League. 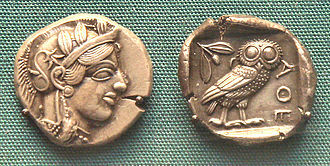 Magnesia may have ruled for a time by the Lydians, and was for some time under the control of the Persians. 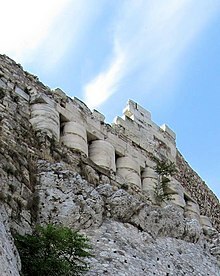 In years, Magnesia supported the Romans in the Second Mithridatic War, Magnesia soon attained great power and prosperity, so as to be able to cope even with a challenge from Ephesus. 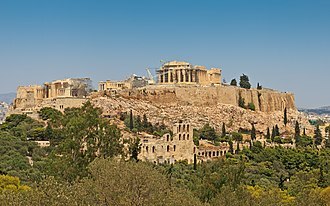 However, the city was taken and destroyed by the Cimmerians, the deserted site was soon reoccupied, and rebuilt by the Milesians or, according to Athenaeus, by the Ephesians. 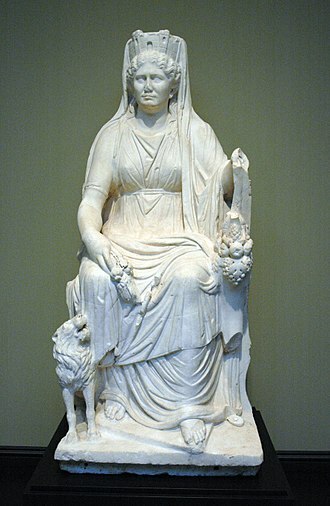 The Persian satraps of Lydia occasionally resided in the place, in the fifth century BC, the exiled Athenian Themistocles came to Persia to offer his services to Artaxerxes, and was given control of Magnesia to support his family. 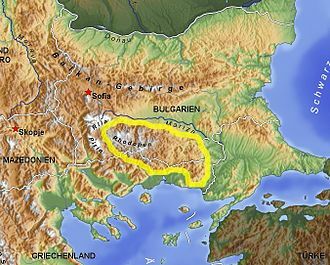 The name magnet may come from lodestones found in Magnesia, in the time of the Romans, Magnesia was added to the kingdom of Pergamus, after Antiochus had been driven eastward beyond Mount Taunts. 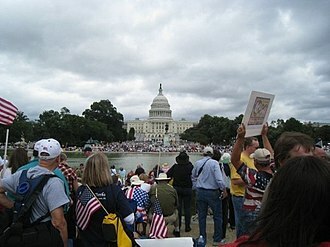 After this time the town seems to have declined and is mentioned, though it is still noticed by Pliny. 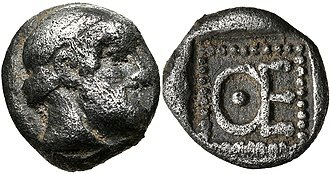 Hierocles ranks it among the bishoprics of the province of Asia, the existence of the town in the time of the emperors Aurelius and Gallienus is attested to by coins. The great amphitheater at Magnesia, the best-preserved in the Anatolian region. 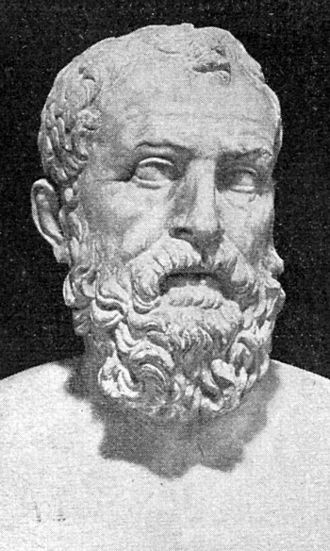 Archeptolis, son of Themistocles, ruled Magnesia circa 459-412 BC. 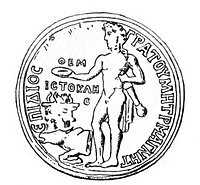 Seal of King Darius the Great hunting in a charriot, reading "I am Darius, the Great King". British Museum. 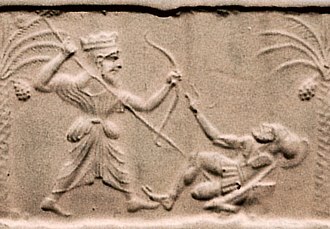 Achaemenid king killing a Greek hoplite. 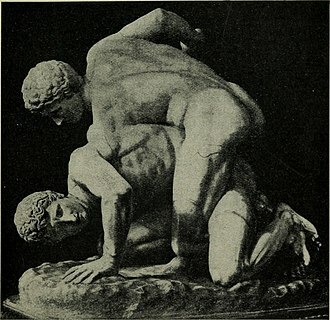 Circa 500 BC–475 BC. Metropolitan Museum of Art. 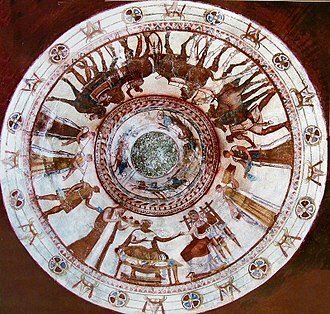 Drawing of Darius the Great and its inscription (ΔΑΡΕΙΟΣ, top right) on the "Darius Vase"
Site of the Battle of Artemisium (center). 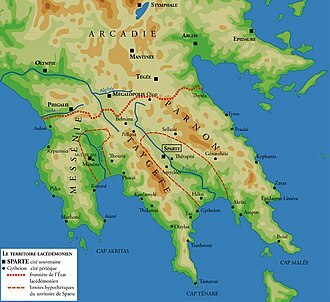 The location of the Battle of Thermopylae appears in the lower left corner. Beach at Cape Artemisium. Magnesia in the distance. 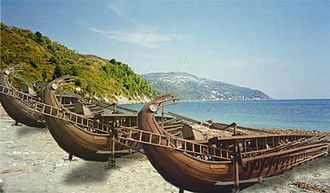 The Ionian fleet, here seen joining with Persian forces at the Bosphorus in preparation of the European Scythian campaign of Darius I in 513 BC, was part of the Achaemenid fleet at Artemisium. 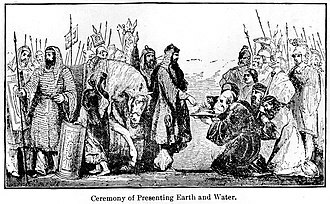 19th century illustration. The heavily equipped Egyptians fought successfully against the Greek hoplites. "Head of Pisistratus, and hand of Alcibiades" ("Tête de Pisistrate et main gauche d'Alcibiade"), a study by Ingres for The Apotheosis of Homer, circa 1823-1834. Ingres Museum. 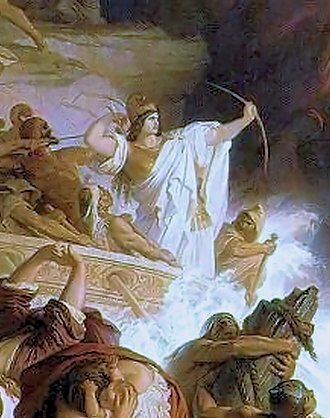 Pausanias offering sacrifice to the Gods before the Battle of Plataea. 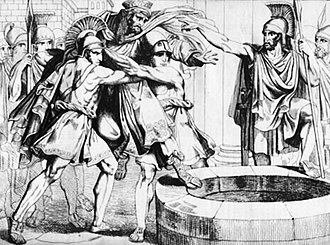 Death of Pausanias, pursued by the Spartan Ephors. 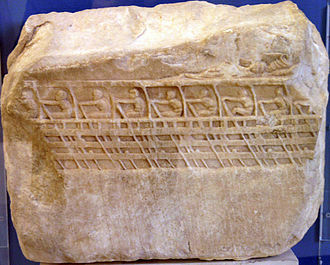 The Lenormant Relief, from the Athenian Acropolis, depicting the rowers of an aphract Athenian trireme, ca. 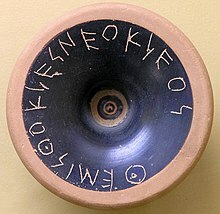 410 BC. Found in 1852, it is one of the main pictorial testaments to the layout of the trireme. 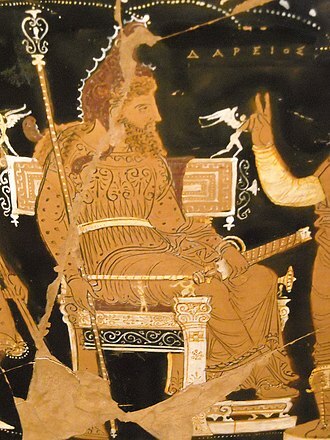 Hipparchus, brother and minister of the tyrant Hippias, being assassinated by the "Tyrannicides" Harmodius and Aristogeiton in 514/513 BC.